Long-term ethnographic research in Bolivia, conducted regularly since 1991, has been invested in understanding what it means to be “indigenous” in this majority indigenous country, in particular, in a region historically characterized by extensive cultural mixture (mestizaje) and among people often assumed to be “non-indigenous.” This research gives close attention to the work of political coalition-building, or “problem-solving networks,” along the urban periphery in and around the provincial capital of Quillacollo, near the city of Cochabamba. A regular focus of this work has been attention to the ways that local advocates, representatives, and political operators make use of national, popular, and indigenous cultural heritage as part of the everyday social engagements composing efforts to build political “careers,” and as people who operate in intimate proximity to the potential stigmatization, appropriations, and creative reinventions associated with upwardly mobile indigenous identity (cholaje). At a national level and particularly since 2000, this work has also been concerned with how indigenous and popular mobilization has substantively reinvented Bolivia’s political public sphere, in particular the meaning of: democracy, sovereignty, citizenship, and indigenous belonging. At the same time at the national level this research examines the political negotiation of identity against the changing international backdrop of neoliberal policies and politics, as this has continued to give shape to domestic spaces of multiculturalism in Bolivia and elsewhere. 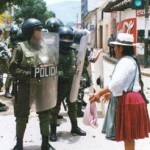 In other words, this work has been concerned with the ways that local indigenous cultural frameworks in Bolivia have maintained an ongoing and constructive dialogue with, and are in important ways authorized by, local problem-solving networks, grassroots popular and indigenous movements, as well as international and global currents of indigenous rights. Much of this research has recently been detailed in my book, Roosters at Midnight: Indigenous Signs and Stigma in Local Bolivian Politics (School of Advanced Research Press, 2010).